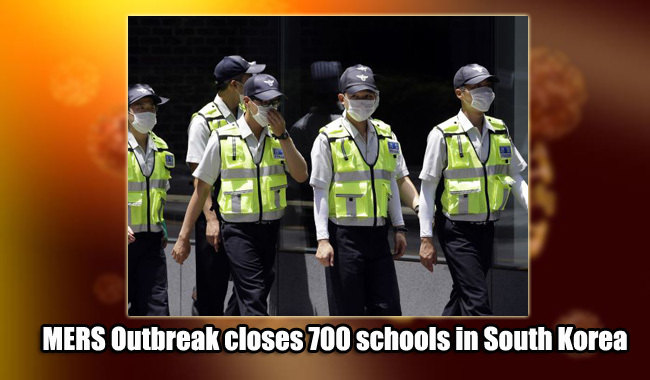 An increasing wave of panic swept over South Korea as an outbreak of the MERS virus infected 35 individuals and killed two of its victims on Thursday, June 04, 2015. Residents of South Korea fear that the outbreak of the Middle East Respiratory Syndrome, commonly known as MERS, in the country appears to be largest yet outside Saudi Arabia. As a result, over 700 schools, ranging from kindergarten to colleges and universities, have shut down and closed off their gates in response to public fears to ease the tension. Thousands of tourists and visitors to the country have also cancelled their trips. According to the health ministry, an additional five infections were confirmed on Thursday, bringing up the total number of known cases to 35, alarming the residents. Public concern had grown evident in Seoul, as a daily increase in the numbers of commuters are seen wearing face masks on buses, subways and other modes of public transportation. With no known cure or vaccine, the MERS virus is considered as an even deadlier but less infectious cousin of the Severe Acute Respiratory Syndrome or SARS, which had killed hundreds when it surfaced in Asia back in 2003. The first case of the virus in South Korea to be reported was that of a 68-year-old man, who was diagnosed after a trip to Saudi Arabia. Since this first case has been reported on May 20, more than 1,300 more individuals have fallen victim to the virus. These people have been placed under various levels of quarantine as they may have been directly or indirectly exposed to the virus. While many victims were strongly advised to stay in their respective homes, some were isolated at state-designated facilities. Not only did this outbreak affect the lives of those who are living in South Korea, but also the nation’s tourism as well. The Korea Tourism Organisation (KTO) has reported that around 7,000 tourist mostly from the countries of China and Taiwan, had cancelled their travel plans to the country in anxious fear of being exposed to the virus. A KTO spokesperson told AFP that almost all the main reasons of cancellations were due to the MERS outbreak. Due to the slow response to the initial outbreak, not only health officials in general were criticized for it, but also the administration of President Park Geun-Hye. On Wednesday, Park was said to have called for “utmost efforts” to prevent the spread of the virus and decrease public fear in an emergency meeting held with health officials. The MERS virus has now infected 1,161 around the globe, and has resulted to 436 deaths. Over 20 countries were affected, with most of its cases were reported in Saudi Arabia.